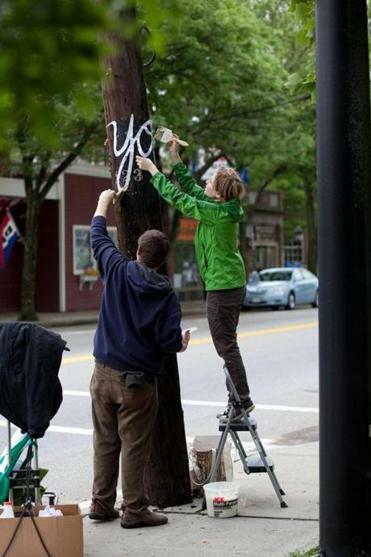 Hannah Verlin is installing “Thoughts Are Free,” based on verse found in the Warsaw ghetto, along Main Street inMedfield this summer. 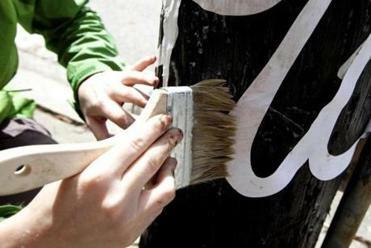 Telephone poles might seem an unlikely canvas, but they are being used in Medfield to create a “sculpture path” that is meant to highlight cultural destinations and happenings in town. Anyone walking or driving along Main Street (Route 109) near the center of town may notice bright white letters appearing on the poles this summer. The temporary exhibition marks a proposed cultural district, while also exploring the theme of this year’s Medfield Reads program. Hannah Verlin, (right) with the help of husband Andy Pickering, installed her public art exhibit. The white words, in both English and Yiddish, are from a poem called “Thoughts Are Free,” which was found among documents buried in milk cans in the Warsaw ghetto during the Nazi occupation in World War II. The poem was chosen because it ties into the book chosen by the Medfield Public Library for its community reading project, “Outwitting History: The Amazing Adventures of a Man Who Rescued a Million Yiddish Books,” by Massachusetts author ­Aaron Lansky. “It is in part a marketing tool for the town with an eye toward attracting tourists,” said Jean Mineo, chairwoman of the town’s Cultural Council, and the project manager. And it’s also about “identifying cultural assets in the community,” she said. There are quite a few of those. Although a small town, Medfield traces its history to the 1600s, and boasts such landmarks as the Peak House, which was built around 1668, and rebuilt around 1680 after it was burned down during King Philip’s War. The outdoor installation, with 16 sites in all, will stretch along Main Street between the Peak House and the old section of Vine Lake Cemetery. 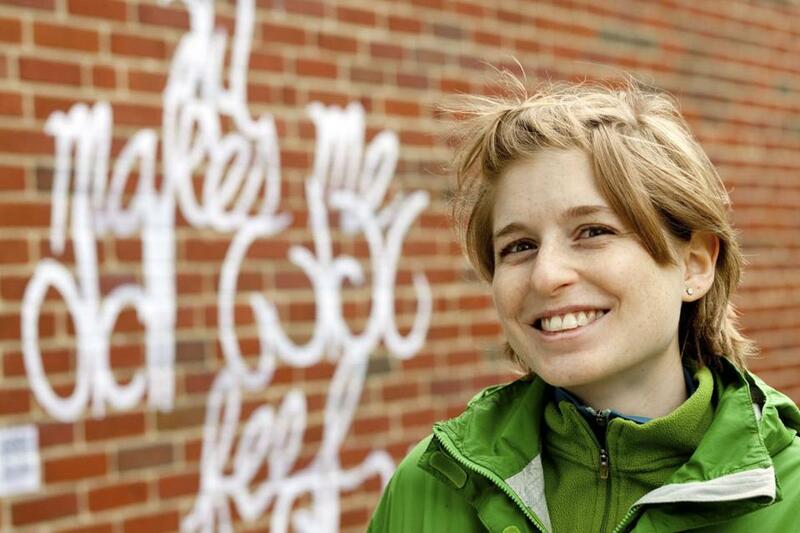 It is the work of Somerville artist Hannah Verlin, who has completed about a third of the project and will continue her work through the summer. The path roughly demarcates the proposed cultural district, which would include all of the local properties on the National Register of Historic Places, about 50 businesses, and most of Medfield’s religious and government institutions. The cultural district designation is being sought as part of a Massachusetts Cultural Council effort, launched last year as a way for communities to gain access to a wide range of programs and resources. Although there’s abundant history to showcase, the sculpture path also spotlights some of Medfield’s newer cultural attractions, including the Zullo Gallery Center for the Arts, where the white paper letters take a brief detour from the telephone poles and land on a brick wall. And that’s the idea. It’s meant to be a conversation piece, he said. The gallery has another link to the library’s Medfield Reads program with an ongoing exhibit through June 24. Because Lansky’s book is about Yiddish and cultural history, the gallery is hosting “Outwitting History,” a juried show in which artists explore their own cultural history. The collaboration of so many groups in town — the sculpture path links the Medfield Historical Society, the Vine Lake Preservation Trust, and the library, among others — helps all of the organizations. “We’re all close, we’re all doing things, we all know each other,” said Pope. Verlin said she purposely used cheap, thin paper, called sign-makers’ paper, and wheat paste to adhere the English and Yiddish words for the outdoor installation. There’s a personal connection for her because Verlin, who is 29, is from a family of Ashkenazi Jews, and like many such families each generation has a lost a bit of the language, she said. She said although her great-grandparents were fluent in Yiddish, she only knows the words that are in the common vernacular. The Cultural Council’s Mineo said the work on the proposed cultural district and the sculpture path has helped bring together many groups in town, and she is rooting for it to foster ongoing collaborations. “I do hope that more people become involved in the cultural offerings of the community and that the organizations become stronger through collaborative efforts,” she said. Lisa Kocian can be reached at lkocian@globe.com.